Food, Wine, Beer, Tea, Coffee… at Peryton, Copenhagen. 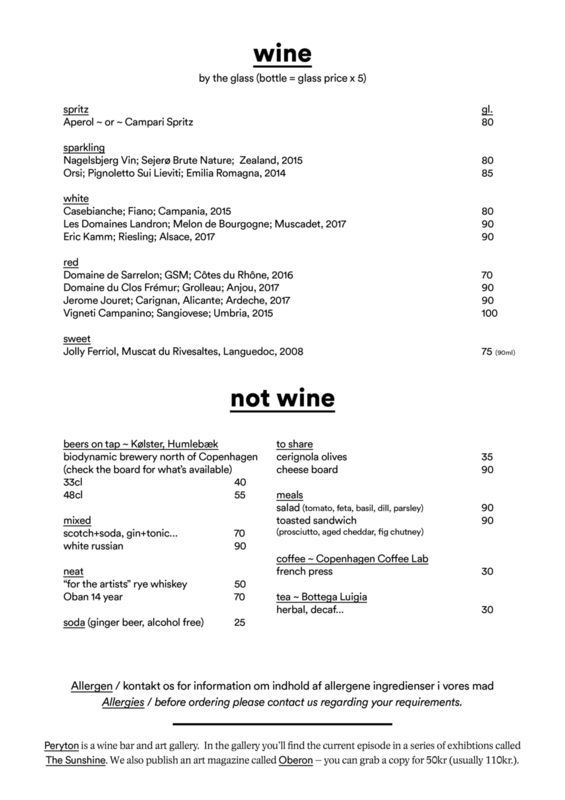 We usually have about 8 wines by-the-glass. We find this is enough to satisfy the "decision tree" – but – we do have more by the bottle and a bunch we can open up if we're going on a journey. Our wines are from Rosforth & Rosforth, Melin Vin and Vinikultur, beers on tap from Kølster malt & beer – coffee from Copenhagen Coffee Lab and our teas are from the selection of the super lovely Bottega Luigia. Allergen / kontakt os for information om indhold af allergene ingredienser i vores mad ~ Allergies + Intolerances / before ordering please contact us regarding your requirements. Prices may differ, depending on produce and availability.